Limeade will forever be a reminder of sunny afternoons spent in my grandmother’s Buick, sitting in the hundred-year-old drive-in diner, sipping on styrofoam cups filled with pebble ice and limeade in its purest, 3-ingredient form. There is so much magic to be found in the past. I firmly believe that our brains are equipped with their own kind of rock polisher which, as the years go by, works on one decade at a time, polishing series of memories and stages of life, bringing out the dazzling and blurring out the pain. Call it romanticism. Call it denial. I know it’s real and I’m thankful. I’m thankful because when I gaze back into my younger years, I do not see the weeks spent in a hospitable bed, the scraped knees, the Barbie pool party set I saved so long for only to bring home a tiny pink pool which refused to inflate, or any of the things that might cast a shadow. Sure, I can remember them, and I do, but those fade to the background and all I can do is smile when I think of drinking coffee-flavored cups of cream with Mama, the day I saved enough money for that long-awaited Polly Pocket Cruise Ship, or those days of going to the most incredible drive-in with my grandmother and drinking what is still today my favorite cold drink. Let’s make a drink, a memory, a moment in time to sip and to savor. I just recently discovered creamy limeade, and while it sounds like a fantasy doomed to failure, we have chemistry on our side here. First, we are making what might be the lime-iest limeade you have ever tasted. Whole limes, cut into quarters are thrown into the blender; no juicing required. 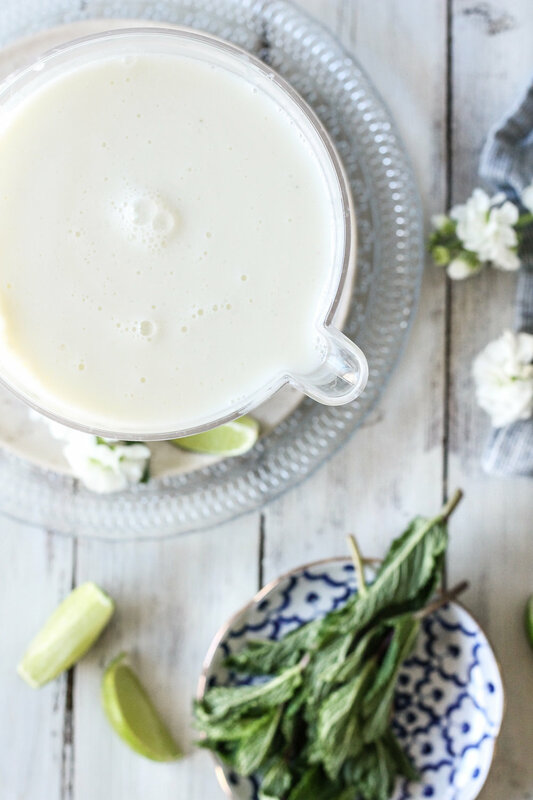 Fresh mint is the secret “extra something” that will keep your friends guessing and make this drink really feel like a sip of spring. The limes and mint will be joined by cold water and sugar before being blended into oblivion. The mixture is then strained and whisked together with a generous splash of sweetened condensed milk to add sweetness and creaminess. It’s a lovely balance, and I like to think of this mocktail right here as the more elegant, subtle version of classic limeade. It is not overly creamy, certainly not enough to be considered rich, it just adds a faint, softening element - very reminiscent of horchata. A lot of you may still be worrying about this situation turning into ricotta cheese before your eyes, but it is not as if we were adding cream to lime juice. The ratio of water and sugar to the lime and milk is such that there is no fear of curdling. It’s tart, sweet, herby, and fresh and I cannot think of anything better to sip out on the patio on these cool, spring evenings. You can also throw this drink together in advance; a bit of time in the refrigerator actually helps the flavors to meld. Just give it a quick stir right before serving. Aren’t you so happy to be back in the season of pretty drinks? This drink is also light enough that I think it would be beyond amazing served with tacos, especially these tacos. Cheers to memories in all their golden, nostalgic glory. Place lime quarters, fresh mint, sugar and water in the base of your blender. Pulse on high speed until the limes are broken down into fine pieces. Pour the mixture through a fine-mesh strainer and into a pitcher. Whisk in sweetened condensed milk. Cover with plastic and refrigerate until ready to serve. 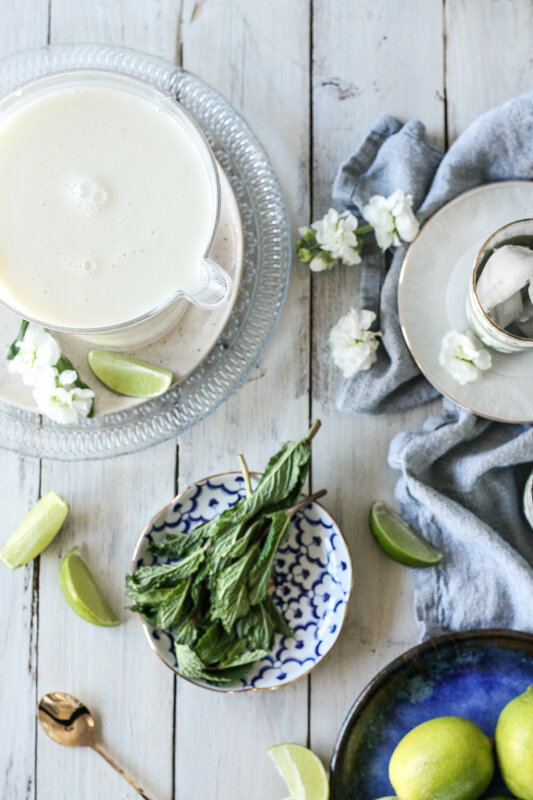 To serve, pour over ice and garnish with fresh mint and lime wedges, if desired. If the limeade has separated at all, stir the mixture well before serving. Cook’s Note: Limeade can be made up to four hours in advance and refrigerated until you are ready to serve, but do not store overnight as the lime will become bitter if it is allowed to sit for too long. A couple of weeks ago Mr. Pedantic and I spent our Saturday with some super wonderful humans at the slice of heaven known as a Taco Festival. Yes, it really was as incredible as it sounds. Though her stigma is strong, I have always ridden against popular opinion. I love Mondays. I really do. They are so full of promise. A fresh, new week. A blank slate. A (hopefully) restful weekend backing me up as I get back down to my routine, which, albeit monotonous at times, brings me such comfort. It's Monday and that means that our weekend diet of Irish pub food and more than a few ice cream cones is at an end. That being the case, I can think of no better time to share with you one of our favorite weeknight meals.